"Preparing this recipe is literally the first thing I do after I wake up on weekend mornings. I put the bacon in the oven (must be cold! ), brush my teeth, start cooking other breakfast items, and then take the bacon out after 14 minutes - that's it! My bacon theory is that by placing the bacon in a cold oven to start, as the oven gradually heats to 425 degrees F (220 degrees C), the bacon undergoes a magical transformation from cold flabby piece of meat, to simmering deliciousness, to crispy bacon heaven as the oven hits the 425 degree mark. Enjoy!" 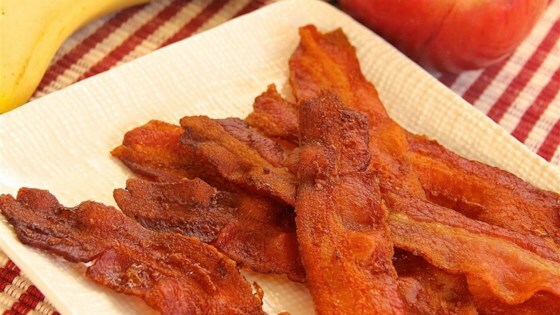 I like to use naturally hickory smoked thick-sliced bacon to achieve the best results. You might want to check on the bacon after 12 minutes or so to account for the differences in oven heating times and/or thickness of bacon. Pair this recipe with Ken's Perfect Hard Boiled Egg recipe which also takes 14 minutes to prepare. too high temp for too long! This recipes is fantastic. I used to think, "Why would I need a recipe for bacon?" Then I tried it. WOW. The apotheosis of perfect, easy bacon. Do yourself a favor: Make the bacon. Sorry stove top, but you've burned my bacon for the last time. I'm all about the oven now.